Visual Studio Code>Other>VS Code . *projNew to Visual Studio Code? Get it now. This extension will helps you keep your *proj files in sync when using VS Code. This is useful if you work in a team that uses both VS Code and Visual Studio. This extension needs a Visual Studio Code Workspace in order to be activated. When you switch to or create/update/delete a file/folder, it will find the nearest . *proj up the file system tree, and update it depending on the action you've done. You can see extension output in the output tab of the terminal. 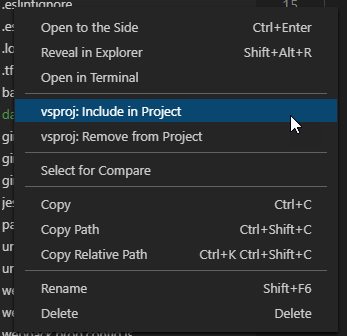 vsproj.projExtension VS project file to watch and update. Defaults: "njsproj"
vsproj.encoding VS project file encoding. Defaults: "ascii"
vsproj.includeRegex Regular expression to match files you want to add to vsproj. vsproj.excludeRegex Regular expression to exclude files you do not want to add to vsproj. These regular expressions will prevent unwanted files to be added in the proj file. If a file matches includeRegex and excludeRegex, it will be excluded. You can also ignore files by workspace with the exclude setting described above. Renaming file or folder and changing only case will create a second entry with the new file/folder name without removing the previous.